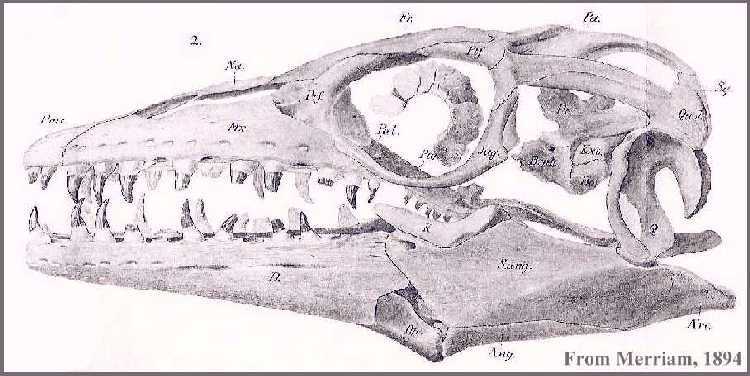 LEFT: Left lateral view of the skull of Platecarpus tympaniticus Cope 1869 (from Merriam, 1894). Page 44 Dan Varner Paleo-Life Art Page Excellent art work on extinct marine reptiles.. Page 48 Anatomy of a Plesiosaurus Skull An 1896 drawing is used to illustrate the bones of a plesiosaur skull. Page 87 Kronosaurus queenslandicus Giant Cretaceous pliosaur from Australia ???? Page 88 Thryptodus zittlei Battering ram fish from the Cretaceous of Kansas ?? ?